Spruce trees and shrubs are classified in the genus Picea, which includes 35 species. It is considered to be part of the Pinaceae family, along with pine trees, fir trees, cedars, hemlocks, larches, and a few other species. You should be able to identify a spruce tree just by looking at its needles. These conifers feature needles attached to the branch by a swollen area called a pulvinus or joint-like structure, which allows extra flexibility and movement. The pulvinus, which resembles a peg, is left behind if a needle drops and is a telling sign identifying it as spruce. Another notable characteristic for identification is that, unlike the fascicles (or clustering needles) of pine trees, each pulvinus holds only one spruce needle. The pulvini are arranged in a whorl around the branch. The needle shape is another clue: If you slice straight across a needle, it exhibits either a triangular or square shape. Spruce trees are monoecious, meaning they have both male and female reproductive structures. The female cone scales of spruce are more flexible than those of pine trees. The bird's nest spruce is a variety of Norway spruce that forms a dwarf round shrub with an indentation on the top, making it look like a bird's nest. This shrub can work well in a container if you wish to have a small evergreen conifer on your patio, for example. It grows between 2 and 4 feet tall and is suited to U.S. Department of Agriculture plant hardiness zones 3 through 8. The black spruce does well in wet areas and lives primarily in an environment called boreal forest or taiga. It is one of the primary hosts for the eastern dwarf mistletoe (Arceuthobium pusillum). If you would like a small version of this for your garden, look for the "Nana'" cultivar, which is a recipient of the Award of Garden Merit from the Royal Horticultural Society. It is suited to USDA zones 2 through 5. The species name breweriana honors the tree's founder, William Henry Brewer. It is sometimes called the weeping spruce because of the way that the branchlets hang down. This would be an excellent choice for a specimen tree in your garden—the weeping form really makes it stand out. It is a winner of the Royal Horticultural Society's Award of Garden Merit and is suited to USDA zones 5 through 8. The Caucasian spruce can live in a wide variety of soil types but needs to be sheltered from winds. This tree works well as a specimen conifer. If you want one with yellow needles, look for the "Skylands," "Aureospicata," and "Aurea" cultivars. "Barnes" and "Nana" are dwarf cultivars, while "Gowdy" is columnar. It is suited to USDA zones 4 through 7. 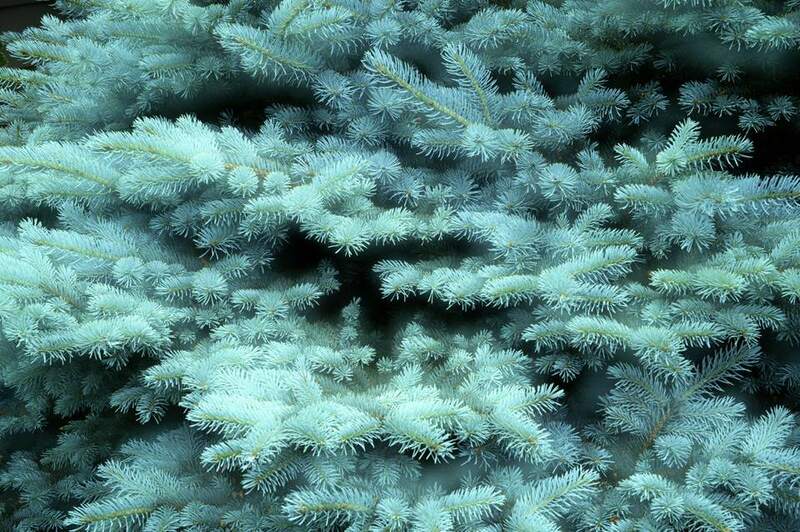 The Colorado blue spruce has blue needles in a range of shades. The "Glauca" variety is a light blue. A weeping variety is "Glauca Pendula." If you need one that is shorter, available varieties include "Fat Albert," "Glauca Globosa," and "Glauca Jean's Dilly." This spruce does well in droughts overall but does need regular watering in hot areas. It is the state tree of both Colorado and Utah. It is suited to USDA zones 3 through 8. Dwarf Alberta is a popular shrub, being a variety of the white spruce that grows in a conical shape. It is a great choice for a living Christmas tree and is commonly used for creating a spiral shrub topiary and other shapes. It also tends to be seen in pots next to a front door. This spruce is suited to USDA zones 2 through 8. The Engelmann spruce was named after George Engelmann, a botanist and physician. Some have considered it to be a subspecies of the white spruce. Its wood is used in the lumber industry and to make musical instruments. These trees can live for hundreds of years. They are suited to USDA zones 3 through 7. The Norway spruce needs soil that drains well and will have problems if the soil is too wet. It can be used as a Christmas tree and is a common source of lumber. It is also often used in making stringed instruments because it resonates well. If you want an unusual specimen, look for the "Inversa" cultivar, a dwarf weeping variety that is a definite eye-catcher. Norway spruce is suited to USDA zones 2 through 7. The red spruce can be planted in areas that receive shade, and it should stay relatively cool and receive adequate moisture. Confusingly, it is also called the yellow spruce, a name inspired by the light-yellow wood of the tree. It is suited to USDA zones 3 through 6. The Serbian spruce can tolerate some drought and shade, though it prefers medium levels of moisture in the soil. It is a good choice for urban landscapes as it has resistance to air pollution. Its species name, omorika, is the Serbian word for spruce. It is suited to USDA zones 4 through 7. The Sitka spruce is the tallest species of spruce and is the state tree of Alaska. It can be over 300 feet in the wild, with the largest recorded specimen reaching 318 feet. It will be shorter in cultivation, but make sure there is plenty of room in your landscape, as "shorter" can mean that it is over 100 feet tall. It is suited to USDA zones 6 through 8. The white spruce is sometimes sold as a Christmas tree. One natural variety is the Black Hills spruce (Picea glauca var. densata), which is the state tree of South Dakota. It can tolerate some light shade and is suited to USDA zones 2 through 6.